We have been in Texas for exactly two weeks now and, except for several rainy days the weather has been great. There are a number of different sandpipers from the north down here for the winter. One new one for me was the Stilt Sandpiper. Like most sandpipers, the Stilt is a transient in the Foam Lake area that breeds in the Arctic and winters in South America. Some stragglers do spend the winter down here in southern Texas, but the size of the flock we observed would suggest that these birds were stopped here temporarily to fuel up for the flight to South America. This article will deal with flycatchers (see article No. 30) which are quite numerous here and much showier than the ones back up north. The southwestern USA has many resident flycatchers three of which exist only in this southern tip of Texas – the Kiskadee, Couches and Tropical kingbirds. I have already written about the Kiskadee (see article No. 38) and I do plan to write about the other two in a future piece. This week’s featured bird is more widespread than the other ones mentioned above, being resident along the Mexican/American border from the Gulf of Mexico to the Pacific Ocean. Of all of our North American flycatchers, this sparrow sized bird is definitely the most colourful. 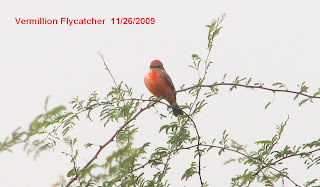 It also has the distinction of being the only flycatcher where the males and females are not the same. 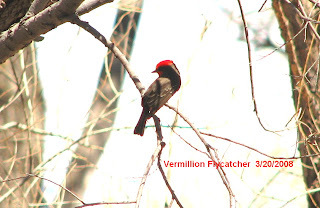 The male has a flaming vermillion head, breast and belly. The back, wings and tail are nearly black with a like-colour mask running from the beak, through the eye and joining the black back just behind the head. The female looks like a striped sparrow with a pinkish or yellowish belly. Although it is a small bird it is very eye catching and once seen, easily identified. However, to see it one has to leave town and go to a park or to rural areas. They are quite tame and approachable, but they avoid living in close proximity to man.